The concept of ‘unconscious bias’ has captured the interest of employers and breathed new life into action on diversity and inclusion in recent years. Like many others, we’ve done a lot of work with clients on this issue, supporting employees and their bosses to acknowledge their own stereotypes, and providing them with tools and techniques to address bias in their day-to-day work. It’s undeniably a step in the right direction, when bias is no longer unconscious. When it’s conscious, there’s a chance to do something about it. But it’s the doing something about it that organisations and individuals often find difficult. And I’ve been wondering why. I’m completely in agreement with Avivah Wittenberg-Cox, who argues in her recent post that there’s something undeniably negative about unconscious bias. Maybe that’s part of the reason employees and organisations don’t seem that motivated to do things differently, despite the ‘surge of interest’ in unconscious bias. They are being asked to ‘manage’ or ‘minimise’ something they now realise they have (individual or institutional bias) but don’t particularly like. Important as it is, there’s nothing particularly motivating or appealing about that. As Avivah says, a more motivating approach is to focus people and organisations on ‘positive outcomes’ rather than ‘accusing them of misbehaviour – conscious or unconscious’. The positive outcome I think we need to focus on is building the skill of how to include – that is, building the desire and the insight and the capacity of employees, managers and leaders to make decisions, do business, to think and act with the conscious intent of including rather than the unconscious effect of excluding. The question for leaders, managers, HR, employees, for all those involved in changing culture on diversity and inclusion becomes not ‘what biases do I have, that I need to manage?’, but a much more positive and empowered and conscious one – ‘what can I or we do here, in this particular situation, to include?’. 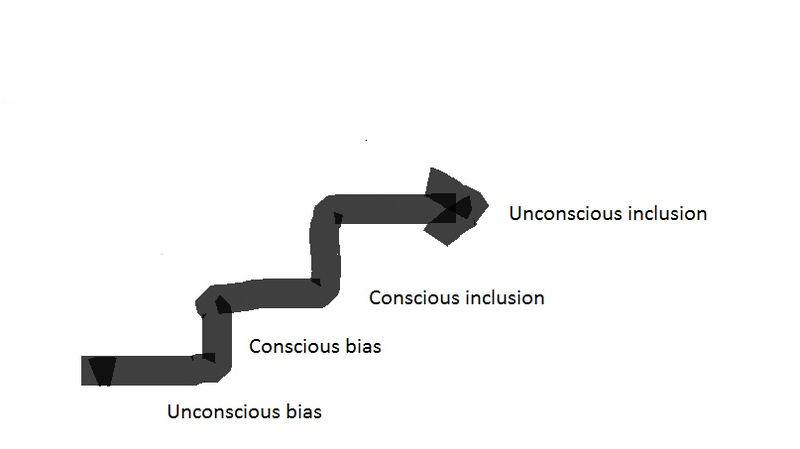 This is the step from unconscious bias, towards conscious inclusion. One of the insights of the work on unconscious bias is to show how discrimination and exclusion are often unintentional, they ‘just happen’. Unlike exclusion, inclusion isn’t something that just happens, at least not yet. It requires effort and attention; it requires us to be conscious. This entry was posted in Uncategorized on 13 March 2015 by forbusinessake.